Studio Jules Art - Blog: One Christmas Project Down, Time for the Rest! One Christmas project has been completed and I'm ready to clean up my studio and get on with planning the next! My studio is in chaos, well, chaos for me. You all know how I like my studio organized and straightened up, I just can't create with piles for fabric on the floor, on the worktable, and sitting on different stools and counter tops. Last night I had a great time at the Dallas Area Fiber Artists covered dish and Christmas Silent Auction. I was able to win a beautiful necklace made by my dear friend, JoAnn Musso, and a black and white original painting by Flo Barry. Both are wonderful women and I am so blessed to have handmade creations from both of them. I try to get one of Flo's black and white paintings every year for Jeff's office. I have decorated it with black and white photos and art work. Next on my " "To Do List" is cleaning up the studio and planning the next Christmas surprises. I have a couple in mind, but I can't tell you, because then it may spoil Christmas for someone. Sorry. I am going to create my plan of action for dyeing fabric, planning out shows to enter, new creations that are in my brain, (some I've pulled fabric for already), plus planning out the creation of our new master bedroom quilt. 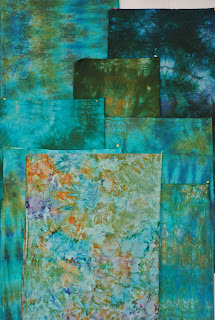 I've dyed most of the fabric already, thought I had dyed it all, but after I ice dyed a yard to add in, I've decided that I may need another yard. Just love the ice dyed fabrics! I hope all you have a productive and beautiful day!